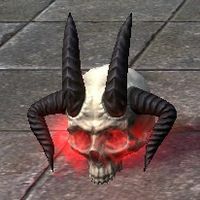 Relics commonly taken from this realm include Daedra-Skulls, Flame-Skulls, and Wraith-Lanterns. Eerie horses, senche, and wolves are sometimes summoned from this realm to be used as mounts, although some maintain that these creatures are simply the result of Illusion magic. Hollowjack-style armor and weapons are crafted using pumpkin, black hawthorn, and amber marble. This page was last modified on 23 December 2018, at 15:45.